Our group has sought out tasting whiskies that people are actually drinking. It’s a populist strategy. A club for the people, or something. So we try to stay in the mainstream. Tullamore Dew is one of those whiskies that you can find most anywhere, so why the hell not. It’s an Irish blended whiskey, to be exact, and a very young blend at that. Looks to be perhaps 3-4 years old. Nose– Some grain sweetness. Some light fruit. But now the bad news: metallic, chemical, rubbing alcohol. Taste– Simple blandness with a bit of spice, vanilla, floral. No character. Finish– Flat, short finish. Hints of…nothing. 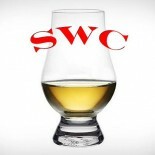 Comment– There are worse whiskies out there. The taste is the only bright spot, however dull it may be. Doesn’t quite match up with the flair and strength of their brand re-launch campaign. Pass.